You just bought a new scope to mount on your rifle and it has a set of rings which are weaver style. A suitable scope base is all you need to start mounting the scope onto your favorite firearm. When looking for scope bases, you will find two styles which seem to be similar in the market. One is called Picatinny rails (MIL- STD – 1913) and the other Weaver rails. The profile of Picatinny and Weaver rails system is virtually identical. The two systems should be indistinguishable from the profile based on the quality of the machining done by the manufacturer. So what are their differences and what rails should you choose to buy? 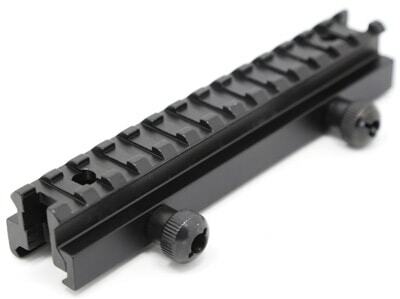 Picatinny rails are also called MIL – STD – 1913 rails or tactical rails. Some of them have the center groove cut down the rail length, but this center groove is not specified in MIL – STD – 1913 issued by the government to standardize the specification of Picatinny rails. This center groove is created to allow the wires routing under the rail cover to support flashlight or other electrical equipment for the weapon. It also allows iron sights to be used on firearm where the placement of the top rail interferes with the sight picture. The slot of Picatinny rail are 0.206” wide and the slot spaces are evenly at 0.394” center to center. For this reason, accessories for Picatinny require the slot to be spaced uniformly; therefore make it usually not fit weaver rails. However, many scope rings in the market have promoted themselves to use on Picatinny rails have a cross bolt sized for the smaller 0.18” Weaver rails in order to make them fit both Weaver and Picatinny rails. Weaver rail slots are 0.18” wide and not having the standard measurement for spacing between them. 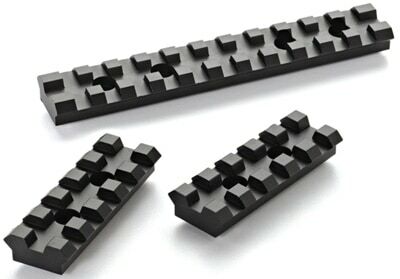 Weaver accessories are designed to be flexible in term of slot spacing. The common example can be scope rings being placed at many points along the body of the scope in order to suit the unevenly spaced Weaver slots. Weaver slots are 180″, smaller than the Picatinny slots (Picatinny rail slots are 206″). For this reason, accessories designed for a Weaver rail can fit a Picatinny rail. Picatinny and Weaver Rails: What Are Main Differences? So the key difference here lies in the width of the slots and the placement of them. MIL – STD – 1913 (Picatinny rails) slot are 206” wide having a center-to-center slot width of 394″. These slots have to be placed evenly and consistently in order for it to be a true “Picatinny” MIL-STD system. Weaver rails have the slots of 180″ width and do not need to be necessarily consistent in a center-to-center measurement from one slot to the next. Both styles of rails can work with your new scope having Weaver style rings. But if the scope has been supplied with Picatinny style rings, it will likely fit only for Picatinny mount. Picatinny mount and rings will commonly be seen on products that was designed for military purpose originally and have found their way into civilian market while Weaver rings and mount can be found by firearms solely sold to civilians in the market. 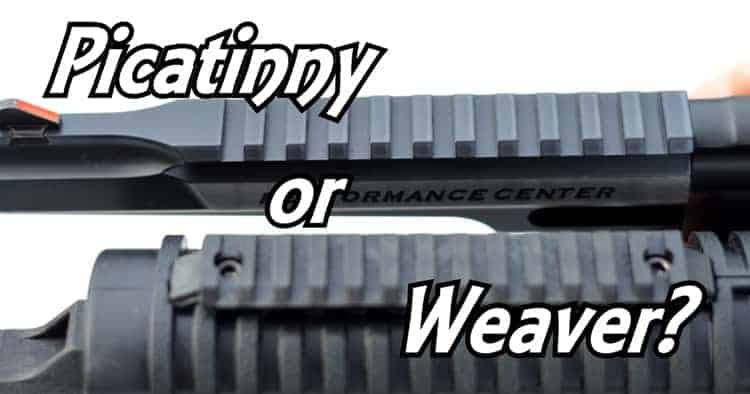 So, Should You Choose Picatinny Or Weaver Rails? For many decades, the Weaver style bases have been around and has proven itself as one of the top choices of mounting platforms for hunters and shooters all over the word. For shooters who want a low profile mount, weaver rails are a great option as it offers an affordable, but still rugged mounting base. Since weaver rails are always offered in two piece set, users can gain full access to the ejection port area of the rifle. Also, 2 piece set bases allows shooters to make very low profile, even to 150”” thick, as there is no need for an ejection port relief cut to clear ejecting brass. Weaver styles rails are an excellent option when you want to use a rifle having iron sights, a hinged floor plate or blind magazine, or just trying to keep weight down on a mountain rifle. The Picatinny rail is also a time-tested design and provide its own benefits as well as drawbacks for users. The Picatinny is considerable the strongest of all mounting system due to its massive size parts and large amount of surface area to mount the rings allowing it to have more front-and-rear flexibility than other mounting systems. In many cases, if you can not make the correct eye relief, an extension base need to be used for Weaver rails while with a Picatinny rails, you just simply need to move to a different slot. Additionally, the ability to use 20 MOA base for long range shooting is a huge advantage of Picatinny rails. Because of the ejection port relief cut in the bottom of the base allowing ejecting brass to clear, Picatinny rails tend to be thicker than 2 piece base set. As the rail covers the ejection port, loading the firearm from the top can be more difficult. A Picatinny rail can be a great addition for guns using a detachable magazine. Hi. I have an AA S400 classic. Can you please tell what rail is the best for my gun? It depends on your accessories. I recommend you using the scope support Weaver style. Both styles of rails can work with your new scope having Weaver style rings.